You’ll find the beautiful French island of Corsica in the heart of the Mediterranean Sea off the coast of the South of France. It’s stunning landscape features a mountainous interior and beautiful coastline of rocky inlets and sandy beaches making it the perfect sunny spot to enjoy an outdoor camping holiday. Steeped in history and full of untouched natural beauty, Corsica is a fascinating place to visit with plenty to see and do. You can enjoy great outdoor activities like water sports, or hiking in the forests. Cool down at the end of the day in the crystal clear waters of the Mediterranean or your campsite swimming pool. With three airports on the island and plenty to explore once you arrive, Corsica is ideal for a fly and drive camping holiday. Ajaccio is the capital of Corsica with a beautiful landscape, sweeping golden beaches and lively waterfront cafés. You can visit the family home of Napoléon Bonaparte who was born here in 1769. 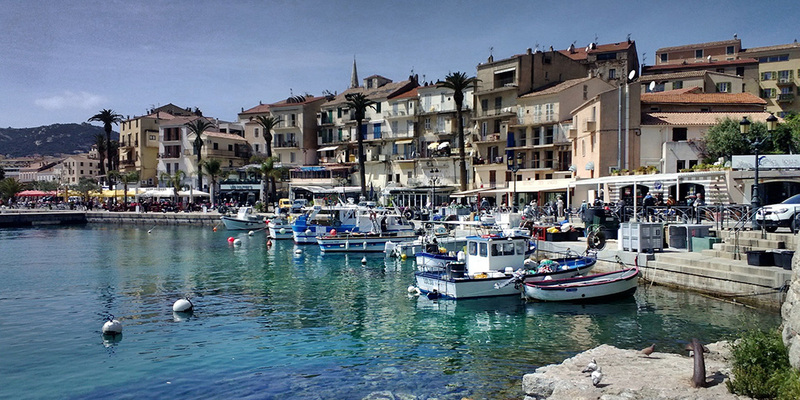 Bastia is the second largest city on the island and well worth a visit to enjoy Corsican culture. The 19th Century Square, Place St Nicolas, sprawls along the waterfront and is home to many cafés, shops and bars. A traditional flea market is held here every Sunday - perfect for picking up a souvenir or two. Calvi is the tourist capital of Corsica with its own stunning 4 mile white sandy beach. Heavily influenced by the glitz of the Côte d’Azur, it’s a magnet for the super-rich who sail their luxurious yachts here from St Tropez. Quai Landry is filled with restaurants, bars, cafés, shops and hotels and is a fantastic spot to enjoy a drink and a spot of people watching. 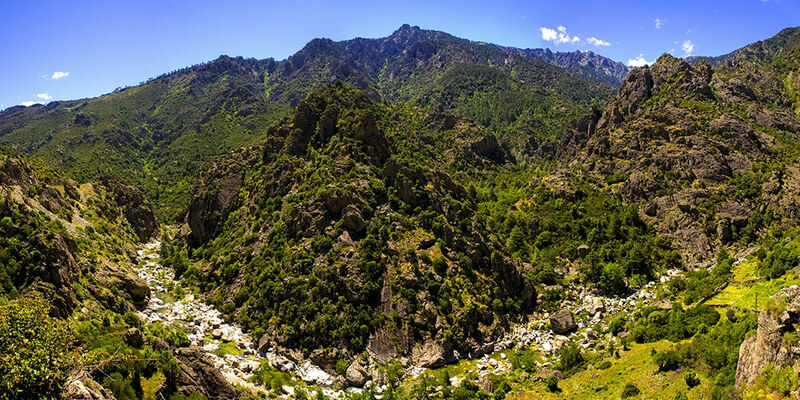 Corte is situated high in the mountains and is often referred to as the heart and soul of Corsica. This stunning mountain top city is home to a university which gives it a lively and cosmopolitan feel. It is also home to many cafés & restaurants – perfect for taking a seat at to watch the world go by. For an authentic taste of Corsican life, head for the tiny fishing village of Erbalunga on the east coast where you can explore network of squares and tiny alleyways or book an organised trek from it’s riding school to explore the mountains and sandy beaches. In August the village comes alive with a jazz festival. Hikers (or bikers) can enjoy the many trails that take you through pretty mountain and seaside villages of Corsica. If you fancy the ultimate challenge there’s the infamous GR 20 hiking trail – the longest in Europe which traverses the whole island diagonally from north to south and takes around 15 days to complete! The Reserve Naturelle de Scandola is perfect for those who love the outdoors. This natural reserve is completely untouched and only accessible by boat. Hop on a tour from Calvi or Porto and spot the dolphins and seals in their natural habitat. Take a day trip to Sardinia. There are ferries that set sail from Porto Vecchio and take you straight to Corsica’s neighbouring island. Spend an afternoon wandering around the busy port of Bastia and explore the narrow streets with their unique architecture – a mix of both Baroque and Genovese. Visit a local market to pick up colourful fresh produce and enjoy a glimpse of traditional Corsican day-to-day life. Camping Via Romana, Prunelli Di Fiumorbo. 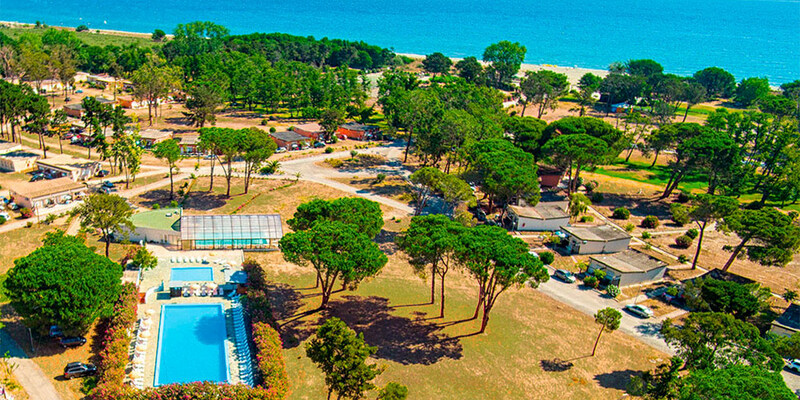 Camping Domaine d’Anghione, Castellare di Casinca. To find your perfect campsite in Corsica please use our interactive campsite finder, call our knowledgeable customer advice team on 0345 268 0827, or explore the individual campsite pages below.